Do you prefer Starbucks® coffee or Caribou®? Scharffenberger® chocolate or Dove®? Wine labels, just like other labels, create brand identity and customer loyalty. So when I am browsing the aisles of a liquor store and find myself in the Spanish section, I admit to instinctively picking up a bottle of Muga. But this happens only after years of enjoying that Bodega’s various offering of wines. The entry reserve label, Muga Reserva, is a blend of Tempranilo (70%) and 20% Garacha (a.k.a. Granache) with the remainder being Mazuelo and Graciano. As long as we’re playing the name game, let me mention that Tempranillo is the classic grape of the Rioja region, but is also known as “Tinto de Madrid” in Madrid, “Cencibel” in La Mancha (as in Man Of), and “Tinto Fino” or “Tinta de Pais” in the Ribera del Duero (an increasingly important region worth noting). It has other names too: in Catalonia, it is known as “Ull de Liebre.” And in Portugal, it is “Tinto Roriz” where it is used as a blend in port. Call it by whatever name (and there are others!) it is a premier grape of Spain and one worth learning about and tasting. The “house” (bodega, chateau) of Muga does more than justice making wine from this grape. As a Reserva from the Rioja region, by law, the wine must be aged at least one year in wood and another two years in the bottle. Muga exceeds this by aging the wine for 6 months in wood vats, then 2 years in 60% new French and American oak. Muga is so concerned with the quality of barrels used for their wine that they employ their own coopers (3 full-time) making barrels. Wood is sourced from Ohio and Kentucky in the U.S. and from France, and then aged two years before being used in barrel makng. Al of this labor and attention to detail makes for some pretty good wine. I tasted dark fruit: blackberry and ripe plum with black cherry. As the tastes developed and matured, I enjoyed hints of coffee and bitter chocolate. The finish is long and balanced in acidity; tannins are smooth and the mouthfeel lush. I’m not alone in appreciating this wine. Wine Enthusiast and International Wine Cellar both awarded the 2006 Muga Reserva 91 points. So did Wine Advocate. We’ve had this discussion before about point ratings and their value. No system is perfect. But I hope you’ll agree that three respected reviewers did not all engage in a conspiracy to say this is good wine. Along the lines of, ”Sometimes a man smokes a cigar because he wants a cigar” I say Muga Reserva earned 91 points because Muga Reserva is worth 91 points. In fact, I will add that at an ARP of $23-$25 U.S., it likely deserves more. 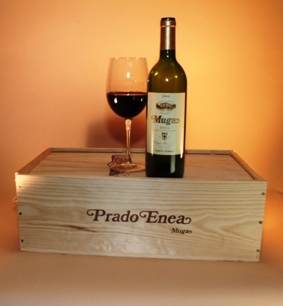 Muga makes wines available at various price levels and labels, including those labeled Eneas, Aro and Prado Enea. A good place to start is with Muga Reserva. They also make white, rose and sparking (Cava) wines. Enjoy the reserve with aged hard cheese, lamb shanks, charcuterie, duck, coq au vin ….. or simply with a good friend on a weekend afternoon.